Terapia Revontuli offers a possibility for therapeutic dialogue that allows clients to unload thoughts and feelings while seeking for potential solutions. The solution-focused brief therapy method increases hope and gives room to breathe. The therapy method is optimistic, empowering and respectful toward clients. Solution-focused brief therapy is therapy with a low threshold. The aim of the brief therapy is to connect the client with her or his own potential while pursuing her or his own vision of a solution. Solution-focused brief therapy is beneficial in the kinds of life situations in which one’s emotional resources are running low, when one is overwhelmed, or when (for one reason or another) it is difficult to see the way forward without a little guidance from outside. It is beneficial to seek help from brief therapy in the following kinds of life situations: when your spirits are constantly low, when you have anxiety, or when you find yourself being overwhelmingly self-critical. Brief therapy can also be of help when you face an upsetting crisis, such as a divorce, unemployment or the death of a loved one. 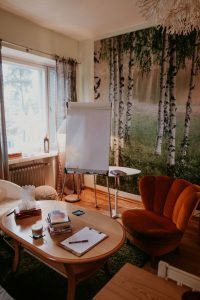 The solution-focused brief therapy at Terapia Revontuli is designed for people who experience a need for outside support, but who do not suffer from a serious mental disorder. © 2018 Terapia Revontuli. Tietosuojaseloste.